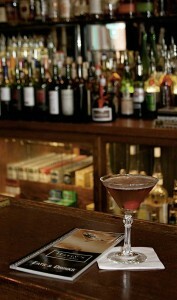 Located in the heart of historic Westport, Harry’s Bar & Tables has been a Kansas City favorite for many years. The classic decor, friendly staff and laid back atmosphere are appreciated by locals and travelers alike. Harry’s attracts a diverse clientele; you never know who you might run into. In the spring, summer and fall patrons can take advantage of our lovely patio and deck bar. It is a great place to gather with friends, have a smoke or simply enjoy the weather. Harry’s menu boasts many handcrafted and classic cocktails, delicious martinis, as well as an extensive scotch and whiskey selection. We offer both afternoon and late-night Happy Hour specials daily, and our kitchen is always open until 2 a.m.
At Harry’s Bar & Tables, our staff believes in great service and good times for all. Come in for a visit and experience all this Kansas City gem has to offer.